As morning breaks Jacob moves from his campsite and there he sees his brother approaching with 400 (armed?) men. After the experiences of the previous night his fear and foreboding seems to have been replaced with a sense of inevitability. He spent the night wrestling with an unknown and unknowable assailant and in the morning he has determined that in this assailant he has experienced and come face to face with God-Yahweh. He is now resolved and moves forward intentionally towards the confrontation with his wronged brother. He arranges his family by order of most importance – the slaves first with their children, then Leah and her children and finally Rachel and Joseph. And then Jacob and his family move slowly towards Esau, Jacob bowing seven times during the approach (this being a tradition and expectation of court life when approaching a king or important and powerful person - this says something about how Jacob now sees his relationship with his twin brother). 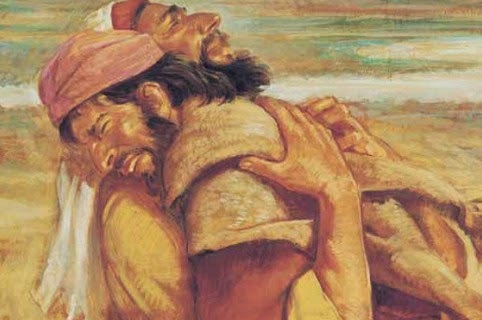 We are not kept in suspense for very long, for as soon as Esau sees Jacob he runs to him and embraces him, and the text tells us they hold each other and weep. It is hard to find words to describe this scene. It is a powerfully emotional scene. After the intensity of the loss and sense of betrayal back when Jacob first deceived Esau; after the intensity of Jacob’s fear during the build up to this meeting it is hard to find words to describe the intense emotion of the scene. And this is true for the two men as well, for there are no words that pass between them. There is only action – the action of repentance and forgiveness and it brings weeping – weeping of joy, but also weeping of sorrow and regret. It is one of the most powerful scenes in the bible. Finally Esau looks up, the two men, presumably, compose themselves and only then does Esau speak and ask about Jacob’s family. Then he asks Jacob what was with all the presents, “I have plenty of property, keep what you have” he tells Jacob. But Jacob persists and Esau relents and accepts the gifts. And then the scene is over. Esau suggests they continue on together for a while, but Jacob gently refuses and they part. And as far as the biblical narrative goes they never meet again. It is important to note what is and what is not contained in this story. It IS a story of forgiveness – intense forgiveness. It is important to notice that Jacob makes no attempt to make excuses, or to seek any kind of self-justification. His behavior from the beginning of this part of the story to its end reflects the actions of complete and honest repentance. But this IS NOT a story of reconciliation. This is not a story of a restored relationship. Jacob and Esau may have put the anger, mistrust, fear and betrayal that had characterized their previous relationship behind them, but it is not forgotten. There is no “forgive and forget” here in this story. What then can this incredible story teach us about God, relationships and forgiveness? 1. Forgiveness does not mitigate consequences. There have been some terrible consequences to Jacob’s behavior towards his brother. He may have successfully stolen the birthright, but it nevertheless resulted in his being a fugitive from his own home. Afraid to return, he lived as an exile for 20 years. It is true for us as well. If you have been victim of a betrayal you might very well be able to come to a point where you can forgive your betrayer, but this does not mean that then there are no consequences for either of you. There may in fact be serious, life changing consequences for both of you. Forgiveness does not eliminate consequences. Jacob’s life is forever, shaped by that act of betrayal, as is Esau’s. 2. Forgiveness does NOT mean – “forgive and forget!” Repeat: Forgiveness does NOT mean – “forgive and forget.” This is not a biblical imperative or value. How this attitude to the contrary ever developed I do not know. But it is completely unbiblical. The ending of this story makes it clear that there is no forgive and forget between Jacob and Esau. They will never be able to restore their relationship. But they can learn and grow and live the rest of their lives now knowing that they have made peace with each other. When we forgive we too need to have learned and grown through the experience – and the same with the one whom we are forgiving. This comes up all the time – but if forgetting is part of the equation then we will never move forward. 3. Forgiveness is not the same as reconciliation. 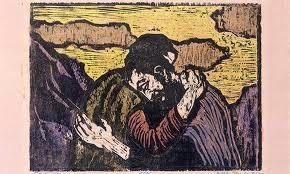 Jacob and Esau do not completely reconcile. They do not restore their relationship. We also may be able to come to a point where we can forgive a hurt or betrayal that we experienced, but it does not necessarily follow that we can be reconciled with the perpetrator. Maybe, but it is a very different process. After his night of wrestling with the mysterious assailant Jacob notes that he had “seen God face to face” (32:30) in his night’s struggle. The experience of repentance and the forgiveness he receives from Esau prompts him to say this: “…truly to see your face is like seeing the face of God…” (33:10). True and honest repentance and forgiveness is a truly holy experience, through which we receive an experience of the Kingdom profoundly come into our lives. There is a lot of confusion about the Kingdom of Heaven in our society, but the New Testament is pretty clear – the Kingdom of Heaven is not off in the future in some distant place removed from our earthly lives. The Kingdom of Heaven is here and now, and to truly repent and to receive the gift of forgiveness is a gift of a “foretaste of the feast to come” when we shall experience God’s presence eternally. True repentance and forgiveness is an experience of God – maybe that is why it is so hard, for like Jacob, we too often must wrestle, for it requires complete honesty – which is not always very easy! Ultimately forgiveness is a gift from God. Jacob and Esau could not do it alone and neither can we. We need to pray for God’s help in being able to honestly repent and forgive others, and to forgive ourselves. God is offering this gift to us abundantly and extravagantly, but too often we would prefer to turn our backs on the gift so we can continue to nurse the hurts, live with our constructed delusions and remain in the familiar surroundings of our prisons. But the gift God is holding out to us is the same gift that Jacob accepted: forgiveness. For in forgiveness we will see the face of God. The listen to the preached version of this sermon go to wartburgparish.com and look for the sermon on the media player entitled "Confrontation and Forgiveness."